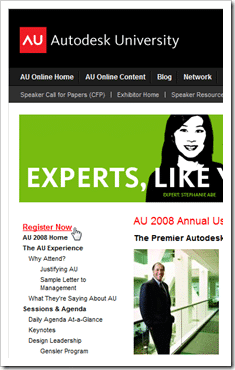 It’s official – registration for AU 2008 is open.In the words of Autodesk, the site is “Sputtering along”, but open nonetheless. While this is certainly inconvenient, it is a promising sign that AU will be bigger than ever (despite the current state of the economy). 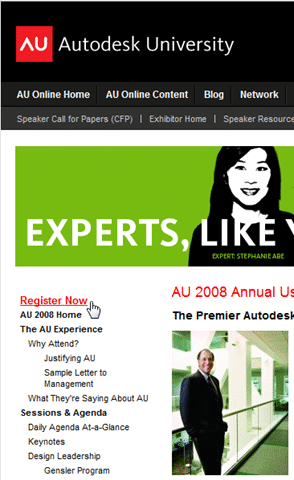 AU 2007 was my first AU, and it really is an incredible opportunity. I’d dare to say you learn just as much in the hallways as you do in the classroom. This year I am excited to have the chance to speak at AU. Sit down, buckle up, and keep your hands on the keyboard (and mouse) as we supercharge your parcel design using AutoCAD® Civil 3D®. Learn how to take nothing more than a boundary survey and turn it into a complete parcel design, cul-de-sac and all. Start with your right-of-way, and finish with labeling. During this class, we’ll work through fundamental parcel creation techniques, and more importantly, when to use which technique. Anyone wanting to get started laying parcels out the quick and easy way will want to attend this class. I hope to see all of you wanting to get started with Civil 3D Parcels in my class at AU this year!